As you can see the wires, after being soldered to the header and heat-shrinked, are also epoxied in place to secure and stress-relieve them (otherwise they could easily break off). 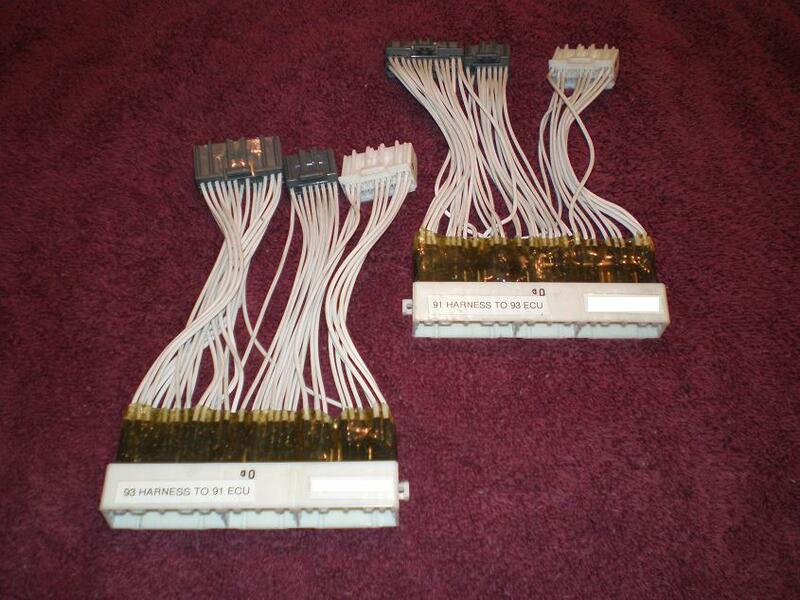 The pins on the ECU side are all crimped using OEM terminals and are machine-crimped. This is done using all new parts. I've done quite a few different setups, like running a 4AGE (turbocharged) with a 3SGTE ECU, and could easily make one to go from an ST165 harness to any version 3SGTE ECU. Typically harnesses like these are around $150 or so, I'll have to see exactly after I build a couple if the price needs adjustment. so whats the price to convert the st165 ecu to the 2nd gen 3sgte ecu? $165 shipped to continental US. 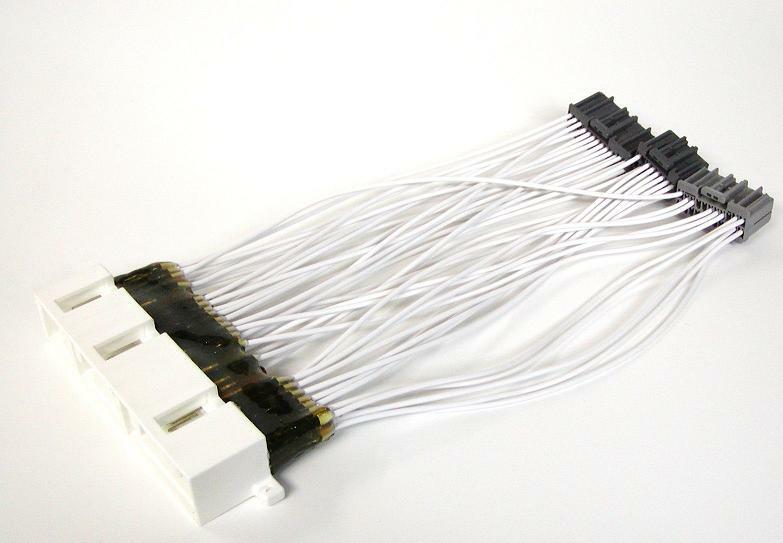 onlinecomponents have a minimum order of 200 pcs for the st165 receptacle. I know because it took them 3 weeks after placing my order to email me telling me about it. I ended up going to tycoelectronics website and requested a free sample. Ordered one day and was shipped the next day from Japan. Shouldve done that all along. On the 185, the circuit opening relay for the fuel pump is controlled by the FC line on the ECU, but looking on the 165 wiring diagram, the same plug on the circuit opening relay connected to the fuel pump is run by the AFM... therefore, if you use a 165 AFM, you don't need to connect the FC pin to anything? Just wanted to make sure, that's the only thing I really had any question left on. This is the last issue I have before I test the harness I made. Does anyone know if the FC wire goes to anything? Also, where do you ground E22 on the st165 harness? is it connected to E1 ground wire? looking back at both st165 and st185 ecu diagrams, E2 and E22 on the st165 ecu are both sensor grounds, and the st185 has only one sensor ground which is the E2. Do I just connect E2 and E22 together to the E2 of the st185 ecu? Well, knowing E22 and E2 are both sensor grounds, I went ahead and connected both together with E2 of the st185 ecu. The car did start. AF was in the high side topping my 16 A/F while engine is still cold. Double checked all the wires and they are all correct. I didnt wire up my intercooler pump so I didnt take it out for a test drive yet. Had a chance to take it for a slow 2min slow drive. Idle seems to be rough at times. AF is still high around 16:1 both idle and partial throttle. I dont know, it did the same thing when I put back my st165 ecu but would go back to normal after a few minutes of driving. Maybe I just need to take it out for a spin around town. Ive triple checked every wire and they are all in the correct spots. I am still not sure where to ground the E22 wire and where the FC wire hooks up to if it does hook up to anything. Where are the guys that have done this? After driving it around town, everything seems to level out. My air/fuel went back to normal and it seems to run smoother and a bit more responsive when you step on the gas. Its def worth the time to make one. i already have the conversion harness from 165 to 90-91 185 but i plan to add in an aem f-ic can you make something to add that in? The next day I drove the car, it stalled out on me 10min into driving and would not start back up. Good thing I was able to just hook the old ecu back. I checked every wire again tonight and everything looks to be in the right spots. I'll try to run the car again this weekend w/out the E22 wire hooked up which is the ground for the afm that doesnt have a match on the st185 ecu, and test a few more things. I dont know why my idle A/F is off. Makes me think there might be something wrong with the ecu I have. I also have available a copy of the Excel Workbook that I created during my completion of this project. If you want a copy, email me and I'll send it along.